Target Signs, the premier outdoor advertising company in Gillette, Wyo., has made the move to digital in a big way. Converting six static faces at once to digital billboards from Watchfire, Target Signs owner Ken Musser has made a bold step forward for his business and for outdoor advertising in the state. Coal Miner 500. Ten minutes after we switched the billboards on, the phones started ringing off the hook." "Ken knows the value of location and did his homework," said Darrin Friskney, of Watchfire. "He has about 70 static faces throughout the area, but he was strategic when choosing which locations to convert to digital." Musser placed higher resolution True-16mm boards near intersections with slower moving traffic and True-19mm boards near highway traffic. Target Signs' journey to digital started out far more tentative. Musser was concerned about building an adequate customer base and financing his investment. What he found was that digital outdoor advertising can draw in an entirely different type of customer. 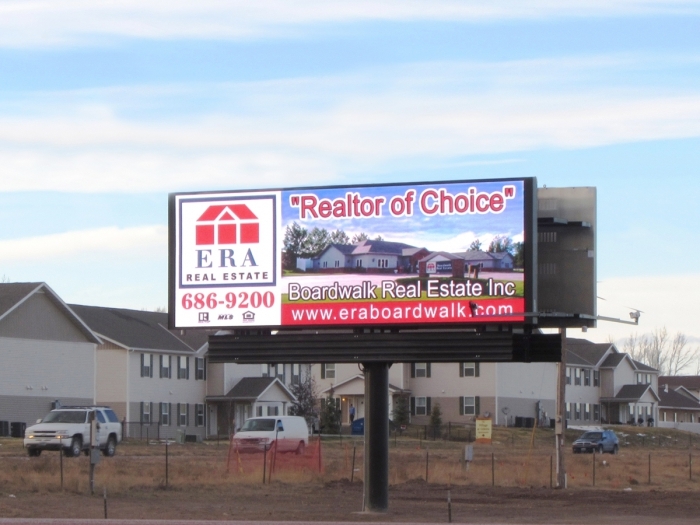 Musser stated clearly, "The digital billboards aren't hurting my static display business at all." What made Musser pull the trigger to invest? "He did the math," said Watchfire's Friskney, "and the potential yield made the decision simple." Musser confirms that talking to other digital billboard operators was an important part of his research, but so was creating an occupancy plan for his boards. When he did, he realized that converting a single face in a location with solid traffic would be a start, but converting several faces at once would make a strong visual impact. "I had billboard locations in that area, and it was time to change them out, so it was almost a perfect fit: take them all down and replace with LED." The new boards represent almost 10 percent of his total inventory. The impact of the digital boards was instant, and Target Signs is on track to meet the occupancy goal right out of the gate. "Demand has been so strong that we can choose our customers," said Musser. "Digital ads have a way of building momentum because people see them more than once. Advertisers love them because they can deliver flexible, timely marketing messages." Strong results are another driver of demand. According to Musser, one retailer's ads for phones led to significantly higher phone sales in a single day. Target Signs' 12-week contracts let advertisers make the most of the medium's flexibility while gaining exposure on the network of digital boards. "We were asking people to make year-long obligations on static boards. Now that seems so archaic," said Musser. Watchfire's web-based Ignite® OA software made designing ads and setting up campaigns from any location easy. Target Signs' bold switch to digital was designed to carry the business forward with the best digital billboard technology. "Watchfire has been a tremendous partner in this process," Musser stated, "The quality of their product is visible…I only wish I had purchased larger faces for two of my locations." Musser's advice to other operators considering a similar move: "Concentrate on your traffic counts. Make sure the size of the billboard is appropriate for the location. And remember, this can actually be fun - my customers are tickled about digital billboard ads."